However, say you're making homemade tortillas and I'm all in. Fresh corn tortillas, where have you been my whole life? I love that chewy texture with the slightly crispy edge. Yum yum. In fact, any bread that needs to be squashed flat such as, flat-bread or Naan can be made with today's project. The bottom base of the press is 12" by 12". 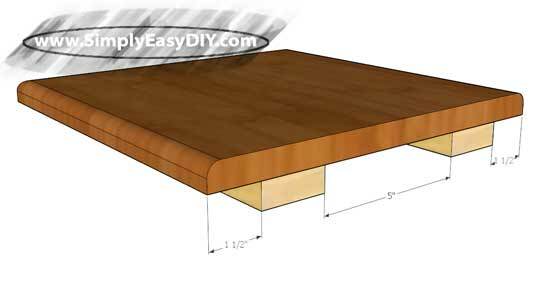 I would add 1" to the top & bottom base piece measurements listed above and edge glue four of them together. That would give us a glue up that would measure 13" x 14". From that glue up you can trim down to the 12" x 12" piece needed. You will need two of them. One to serve as the top and one as the bottom. NOTE: I would ensure that the glue lines run parallel with the tortilla press's handle. You can also round over 3 of the edges at this point as well if desired. Along the underside measure in 1.5" from both sides and glue the bottom runners in place. 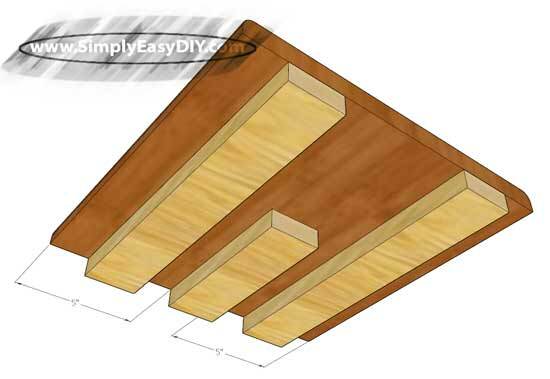 The shorter runner should be centered on the underside of the board. The hinge piece will require some forethought before beginning. First, measure down from what will be the top 1". Mark a cross mark at that location and drill for a 1/4" or 3/8" dowel. 3/8" would be more sturdy. Then cut out the section that the handle will set in with a hand saw. Take your time and be very precise here. 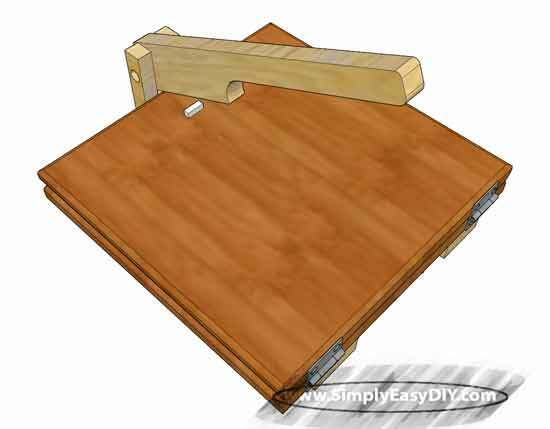 Glue the hinge in place on the middle runner as pictured below. Drill and set four 1/4" dowels to strengthen the connection. 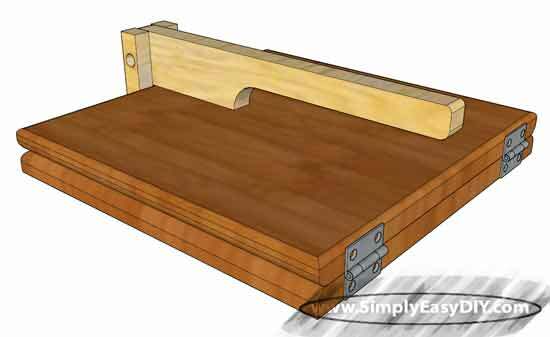 The hinge piece will be undergoing a lot of stress so use hardwood dowels and set 2 into the bottom runner and 2 into the bottom base. NOTE: I thought about making the hinge piece 1-1/2" thick instead of 3/4". Quarter inch dowels would still be used to attach it to the runner but a larger diameter dowel could then be used to attach the handle. Just measure the center 1" down and you're good to go. 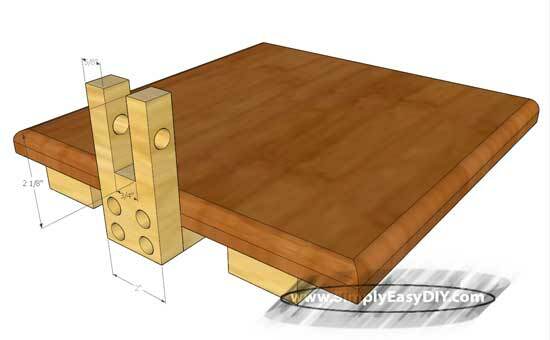 A metal pin would also be an option instead of a wooden dowel. Keep in mind the lion's share of forces will be transferred through the hinge/handle location. 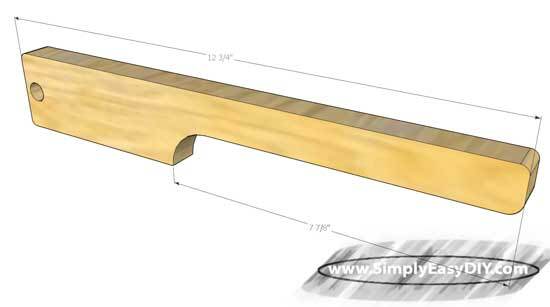 The location of the corresponding dowel hole can be found by measuring in from the back 3/8". Then down from the top 1". The cut out on the forward portion of the handle should be slightly more than finger or knuckle depth. In my case that would be 7/8". Then take it back 5" to 7" or so. This part is not so critical to functionality as it is to personal preference. Fit the handle in place between the hinge forks and tap the dowel in place. (Do not glue). Glue in place a small 1/4" x 1/4" piece that measures at least 3/4" long. This is to allow the handle to apply additional pressure tot he press if needed. I can sum this project up in three words. Hardwood, hardwood, hardwood. Use hardwood species at every turn and in every spot. Do not cheap out. Soft woods just will not hold up over the long term with the repeated stresses. Do not apply polyurethane and do not stain the project. Use a mineral oil or better yet a butcher block oil and reapply often. 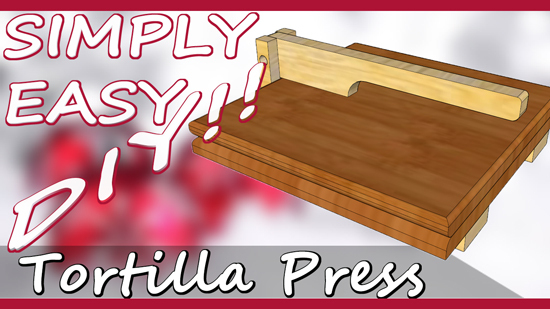 The use of wax paper will not only aid clean up but also help extend the lifespan of your new tortilla press. Do not submerge in water when cleaning and wipe using a damp cloth only. Detergents such as dish soap will strip the oils from the project. That could allow excess water to be absorbed by the press causing expansion followed by contraction when that water evaporates. This in turn could cause checking and cracking. (Ever see a wooden cutting board split down the middle?) We don't want that. I hope you enjoyed our 7th Day of 12 DIY Christmas Gift ideas.